For other uses, see Tripoint (disambiguation). 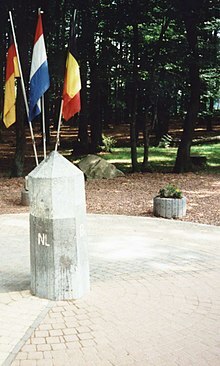 There are approximately 176 international tripoints. Nearly half are situated in rivers, lakes or seas. On dry land, the exact tripoints are usually indicated by markers or pillars, and occasionally by larger monuments. Usually, the more neighbours a country has, the more international tripoints that country has. China with 16 tripoints and Russia with 11 to 14 lead the list of states by number of tripoints. Within Europe, landlocked Austria has nine tripoints, among them two with Switzerland and Liechtenstein. Island countries such as Japan have no country tripoints (some, like Bahrain and Singapore, have tripoints in the territorial waters), and the same goes for states with only one neighbour state, like Portugal or Denmark. Likewise, the United States with two neighbour states has no country tripoints; it has a number of tristate points as well as one point where four states meet. Canada, as well, has five tripoints on land where the boundaries of provinces and territories meet, including one quadripoint where four provinces and territories meet. Border junctions (or "multiple points" or "multipoints" as they are also sometimes called) are most commonly threefold. There are also a number of quadripoints, and a handful of fivefold points, as well as probably unique examples of a sixfold, sevenfold, and eightfold point. No more than eight borders meet at a single multipoint anywhere on earth, but the territorial claims of six countries converge at the south pole in a point of elevenfold complexity. Bratislava is the only capital city in the world which is located at a tripoint: Slovakia, Hungary, and Austria. The city's administrative area extends to the tripoint, but the point lies outside of urban Bratislava itself. the historic Rock of the Three Kingdoms between the former kingdoms of Galicia, León, and Portugal (now part of the border between Kingdom of Spain and the Portuguese Republic). the Tossal dels Tres Reis ('Peak of the Three Kings'), located where the borders of the ancient Kingdoms of Valencia, Catalonia, and Aragon meet. For a full list, see list of tripoints. While the exact line of an international border is normally fixed by a bilateral treaty, the position of the tripoints may need to be settled by a trilateral agreement. For example, China, Russia, and Mongolia have set the position of the two relevant tripoints (the junction points of the China–Russia border, the Mongolia–Russia border, and the China–Mongolia border) by the trilateral agreement signed in Ulaanbaatar on January 27, 1994. The agreement specified that a marker was to be erected at the eastern tripoint, called Tarbagan-Dakh (the marker and the access roads for it are visible on Google Maps, at approximately 49°50′44″N 116°42′50″E﻿ / ﻿49.845625°N 116.714026°E﻿ / 49.845625; 116.714026), but no marker will be erected at the western tripoint (which was defined as the peak of the mountain Tavan-Bogdo-Ula (Kuitunshan, Tavan Bogd Uul). A sign near the tripoint of Slovakia, Hungary, and Austria. This photograph was taken from the Slovak side. The tripoint of France, Italy, and Switzerland is located on Mont Dolent. The southern tripoint of Switzerland, Liechtenstein, and Austria is located at the Naafkopf. ^ Charney, Jonathan I.; Colson, David A.; Smith, Robert W. (2005). International Maritime Boundaries. Martinus Nijhoff. p. 3298. ISBN 978-90-04-14461-3. ^ "JISCMail - INT-BOUNDARIES Archives". www.jiscmail.ac.uk. Retrieved 10 April 2018.